You are here: Kairos Consultancy and Training > Education > K-12 > Accredited Online PD for Teachers! Each day as teachers we are faced with students who need additional help. We’ve all been there, right? The student who was diagnosed with ADHD, the student with dyslexia, the student who is gifted and talented. When you have more than one, it becomes a question of Help! How do I manage this in my class? 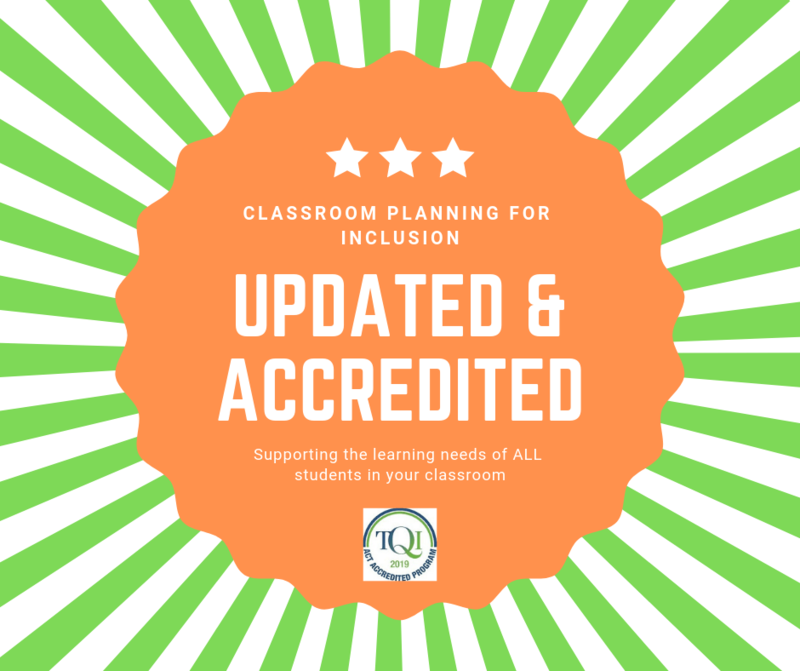 The fully ONLINE PD accredited course, Classroom Planning for Inclusion, has been designed to show you how you can plan the teaching and learning experiences for your classroom, yet supporting the needs of ALL your students. AND planning in a such a way it leaves you space to be creative and innovative, as well as encouraging a little bit of risk-taking. In this introductory course, I take you through the following 3 key curriculum frameworks (see below), which have been successfully used to support the learning of the students in the classroom. Each framework introduction takes about an hour to complete. The whole course, including completing the readings and filling out the bonus workbook, will take you about 5 hours. The numbers in the brackets refer to the Australian Professional Standards for Teachers. The course is recommended for Graduate and Proficient level teachers, or those who have been at the chalkface for a time, as a professional refresher. The course is self-directed and draws on my own 20+ years of experience as a teacher. Throughout you are encouraged to share your learning with others, and to make connections from your own practice. As a fully online and self-directed professional development course, you are encouraged to engage with the material provided, complete the tasks set, and respond to the questions via the discussion boards. This means you will get as much out as you are prepared to put in. The course includes a bonus workbook, with space to make notes on the frameworks covered, both the detail and the examples. Throughout the course, suggestions are made for engaging your colleagues in discussions about applications of the various facets of the frameworks. Examples of applications for planning are given from a broad range of subject areas. And ideas for further applications are given for you to practice. The downloadable bonus workbook also provides space for you to reflect on your learning – which can be used for your online professional reflection for accreditation! If you have engaged fully, by the end of the course you will know how to successfully plan for your classroom using each of the 3 frameworks. And of course – as a fully ONLINE PD, this means you can complete it at Any time! Any where. The course is fully accredited with the ACT TQI – completion gives you 5 hours of accredited Professional Learning. Completions are logged weekly with the TQI. You will also receive a completion certificate for your own records. I have written elsewhere how you can use curriculum frameworks to help you plan for an inclusive classroom. But now it is time to take it to the next level. So, are you ready to get your classroom planning sorted?